Apocalypse NOW, get thee to a shelter (or a generation ship, if you can): the sophomore novel by Corinne Duyvis is as bit as good as I was expecting. The first time Denise’s future vanishes is the day of the announcement: a comet is coming, it’s going to hit the Earth and everything will be different. Those who are really lucky win the lottery to leave Earth in one of the generation ships off to colonise recently found inhabitable planets. Those who are rich or influential (like Denise’s father who is back in Suriname) get to live their lives underground in a permanent shelter. Denise is lucky to get a government-assigned temporary shelter, which might be just safe enough to survive the impact. The second time Denise’s future vanishes is a few months after that, on January 29, 2035, the day the comet is going to hit. That’s when they – Denise, her mother and her sister Iris – need to leave for their shelter just outside Amsterdam. But Iris is nowhere to be found, their mother is hesitating before leaving (is she waiting for Iris? Is she saying goodbye to their lives? Or is she simply high?). By the time they get going (without Iris, Iris never shows up. Has she found shelter elsewhere? Is she even alive? ), Denise knows it is already too late. It is unlikely they will reach the shelter in time, and even if they do, it is highly doubtful they would open the doors. Still, they leave. They are on their way (driving slower than they probably should) and just then, they see Denise’s former teacher by the side of the road, experiencing problems with her own transport and Denise’s mother decides to stop and help. And that’s it. Their shelter is lost to them. But against all odds, that decision proves timely as the teacher takes them to something better: a private generation ship that experienced technical difficulties and was left behind. The Nassau is scheduled to depart after the collision and its captain offers Denise and her mother a brief reprieve, and they are allowed to stay for a couple of days – although they are not allowed to use the ship’s resources, food or water during that time. After that… they need to go back outside to that post-comet wasteland. Unless they can prove their usefulness and be invited to stay because the Nassau? It is not one of the lottery ships, it’s one for people who are useful, who have skills. All of a sudden, Denise is hopeful. Surely she can find a way. Surely she can prove their worth. But how does she do that when Denise herself is autistic, her mother is a drug addict and her sister is not even there. 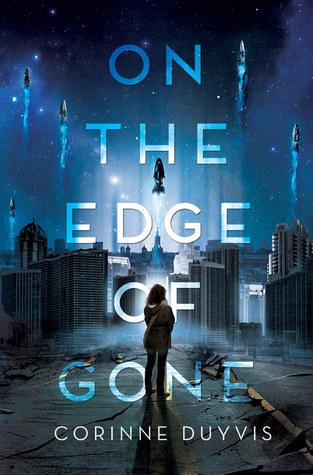 The best word to describe On the Edge of Gone is tense. From Denise’s absolute certainty that staying on Earth means dying to the Nassau’s strict no-rule breaking policy; from the environmental catastrophe looming outside to Denise’s desperate search for her sister; from the people inside the Nassau who just want to get their families into the waiting list to Denise’s struggle to save herself; from stupid heroism to understandable selfishness; from Denise’s coping strategies to the unpredictable hurdles the world is throwing at her – this tale never falters. It’s an unrelenting, gripping story of the apocalypse as-it-happens as well as a fantastic, character-driven novel. One of novel’s biggest draws is Denise’s narrative voice. Denise is autistic and her voice is informed by that without falling into the stereotypical Autism Voice.1 Denise is far from distant, unemotional, and clinical – she experiences things strongly, acutely, deeply. Her voice is beautiful, emotional and profoundly moving because she is a rounded, fleshed out character with agency. She’s right. What I should do is follow Iris’s example: rescue survivors, trek across the city, rebuild. I suppose I will be doing all that soon enough. The extra time Van Zand gave us is running out. It might be the right thing to do, but I’m— I’m scared. I dip my head, unsure how to look at her. She bumps into me lightly. I laugh. I don’t say anything else. But I listen. Which beautifully rounds back to the premise – the question of usefulness, of value, of assumptions made about people when it comes those. Someone is in charge of making the arbitrary decisions when it comes to the Nassau but what is the criteria of “value”, which skill is superior, necessary, essential? The problem is: there really isn’t room for everyone in the Nassau, so HOW do you choose who should stay behind or who should be saved? I am used to apocalyptic stories being dark and grim – in fact, that particular tone feels par-for-the-course to the genre: the world ends, so does any semblance of civilised, humane behaviour. I feel that On the Edge of Gone is refreshingly free of that type of griminess. People stumble. They err. They make terrible choices. They make decisions based on an arbitrary premise. They do not default to being terrible just because. There is no hacking each other to pieces. There is some back-stabbing, rule-breaking, let-me-get-ahead-of-you-because-I-deserve-more that comes from desperation and survival instinct that is both understandable and empathetic. Largely though, people cooperate and help one another. The ending of this novel was so strong exactly because of that. Without veering into spoiler territory, I felt it was an earned ending, a great resolution and a clever turn of events, both in terms of the wider story as well as the utterly personal. It’s an ending that not only felt true to all the characters involved but one which also deeply interrogated how we see people. And well… it’s also an ending that left me on the edge of my seat until it was all done. In other words, On the Edge of Gone is already on the run for a favourite novel of 2016. Thanks for the review! I was really hoping you’d enjoy it, I’ve been so intrigued by the premise of this novel. Glad to hear Duyvis handles Denise’s disability with sensitivity. Great review. It sounds like a really interesting read. Adding it to my tbr list.